Colin McKinney has wanted three things since he met Caroline “Charlie” Collins when he was a junior at Texas A&M University: to make her his wife, play professional football, and have a family. In the first three books of the Infinity Series, Colin and Charlie met, fell in love, broke apart, reunited eight years later, and got married. In the years they were separated, Colin became the starting quarterback for the Dallas Cowboys, but was still chasing his Super Bowl dream. Charlie graduated from Harvard Medical School, fulfilling her dream of becoming a doctor. In “Infinity.”, Charlie and Colin are facing their toughest challenge as a couple yet—finding the balance between their personal lives and career goals. Both are still fighting to have it all. 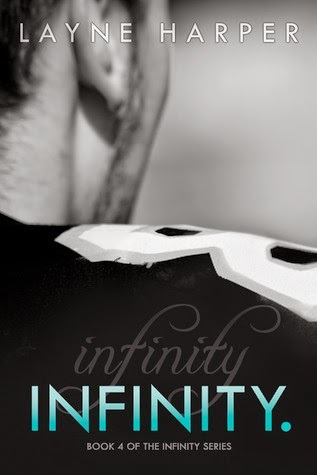 In the final installment of the Infinity Series, will Colin get everything that he’s always dreamt of? And do Colin and Charlie ultimately find their happiness? This is the fourth and final installment of the Infinity series. Usually after a 3rd book I’m done with the story going on and on, but this is definitely not the case with Colin and Charlie. Each book has held my attention and I have never rushed my reading, but rather taking my time to savor every emotion, often times reciprocating it through the words I’m reading. The story definitely needed all installments to fully comprehend the complex story of Colin and Charlie and how they are able to compromise with both of them having controlling personalities. Colin is a complex man. He is a poster child for alpha male. He likes things his way, finds it very difficult to see any other way but his and is overbearing when it comes to making certain his way is carried out, but underneath his control issues he is a man who loves hard and has never forgotten what he felt like when he was away from Charlie for 8 years. His true happiness comes from loving Charlie and the indescribable feeling of being loved by her. He shows strength on the football field and is confident in anything he does, but he also has deep-rooted fears that somehow everything he loves will be taken away from him and he will not be able to save Charlie. These fears have escalated into nightmares, and in what should be one of his happiest days turns out to be him living his actual nightmare and his anger puts a damper on their special day. Caroline is faced with a family crisis and she needs to be in Houston to put her father’s medical clinic back on track. Caroline had been practicing medicine for a local charity in Dallas, but when given the opportunity to use her orthopedic specialty services she has a newfound energy and realizes how much she misses it. The distance between Houston (where the clinic is) and Dallas (where their home is), along with Colin’s active football season makes it extremely difficult for them to be together. This puts a strain on their marriage and doubt settles in Colin’s heart and mind as he recalls that she once chose medicine over him. Will this be another repeat? I don’t fully trust that she’s not going to break my heart again. My heart broke when they were struggling to find their balance. I felt both their pain, but especially Colin’s as there is more to this than just letting Charlie leave for Houston. Whenever she leaves she takes a piece of him and a chunk of his heart when she closes the car door. Something has to give and they are at an impasse until a solution is found. During this time there is a measurable amount of fake love shown for others while at home their distance is growing. The following scene has stuck with me long after I’ve finished and it still brings tears to my eyes. I carefully pick up my hand and place it over his heart, longing to feel his pulse under my palm. It only rests there for two beats before he removes my hand and places it on my hip. He doesn’t say anything as he turns onto his side, breaking our contact and presenting me with his back. Colin has probably come across as being selfish, but when it comes right down to it he makes a selfless decision to make certain that he and Charlie will forever have their happily ever after. My heart expanded at his decision and I love him even more for being able to hold onto his vision as to what pure happiness is all about. I have enjoyed being part of CharCol’s journey. Colin and Charlie have left an indelible impression on my heart. They were young lovers, separated for 8 years before reconciliation, and now they are bound together no matter what obstacle is placed before them. They know what it felt like to be apart and they will not forsake their love again. One gives, one takes, and sometimes one is “bamboozled” only to later being called the bamboozler. Out of the 4 books, I would have to say Infinity is my favorite. The ride that Ms. Harper took us on came to a close with this outstanding finish and I have no qualms giving this book a 5-star rating. It is written from dual points of view, and when it’s Colin turn to speak we see him exhibiting raw emotions. We can feel his love radiating along with his fears coming to life. This series will always remain a favorite of mine. And for those of you that have read Infinity, you will understand this when I say the Infinity Series is PFM.